When autumn gives way to winter, it’s time to dust down the soup cauldron. Ring the changes with some spicy new ideas to warm up the family on those chilly weekend evenings. Pumpkin is in abundance around Halloween and Guy Fawkes night. After you have carved all those scary lanterns, put the flesh to good use. Pumpkin itself is bland if comforting. 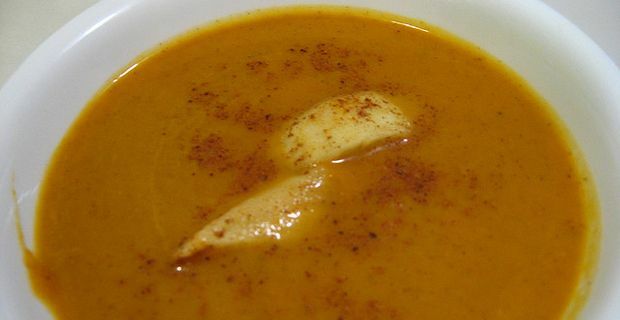 Cooked with a rich stock and curry powder, it takes on a different quality. Season the heat according to your preferences, then blend in some yoghurt to give a creamy finish. Garnish with chopped coriander, mint and spring onion. Chicken soup is a traditional comfort food, especially recommended for invalids. Liven it up with a little Mexican spice. Simmer chicken breasts in diced vegetable stock until they are cooked. Remove them and add chopped chipotle chilli, canned tomatoes, canned sweetcorn, a spoonful of cocoa powder and a spoonful of smoked paprika. Allow the broth to reduce a little before shredding the chicken and adding it to the soup. Serve with tortilla chips and a swirl of sour cream. Hot and Sour soup is all about getting a rich and aromatic base. Beef or chicken stock work well, flavoured with Thai basil, lemongrass or lime leaves for that fresh, citrus scent and rice wine and vinegar for the sour element. The amount of chopped fresh chilli you add will depend on your tolerance threshold, but don’t be too reticent. This soup is supposed to have a kick. Simmer julienne vegetables, shredded pork or chicken and noodles to give the soup body.